Here’s how the celebs are doing summer style. Every week, I scour the web to find inspiring outfits on your favorite celebs and help you recreate their looks! This week, I was inspired by Taylor Swift, Beyoncé, and Elsa Hosk. Read on to see how you can get their looks for yourself. Taylor Swift stepped out in NYC this past week looking flirty in a floral mini dress and over-the-knee boots. She accessorized with some glam oversized round sunglasses and a structured chainlink strap bag for a feminine look. Taylor’s flirty look is for those who aren’t afraid to dress a little “extra,” so embrace your feminine side with a white floral print mini dress and some taupe over-the-knee boots. Since this ensemble already makes a major statement, keep accessories light (but bold). Some oversized round sunnies and a structured studded shoulder bag with a chainlink strap add the perfect amount of flair to the overall ensemble. Beyoncé has been vacationing in Italy with her family, and doing so in style – of course! 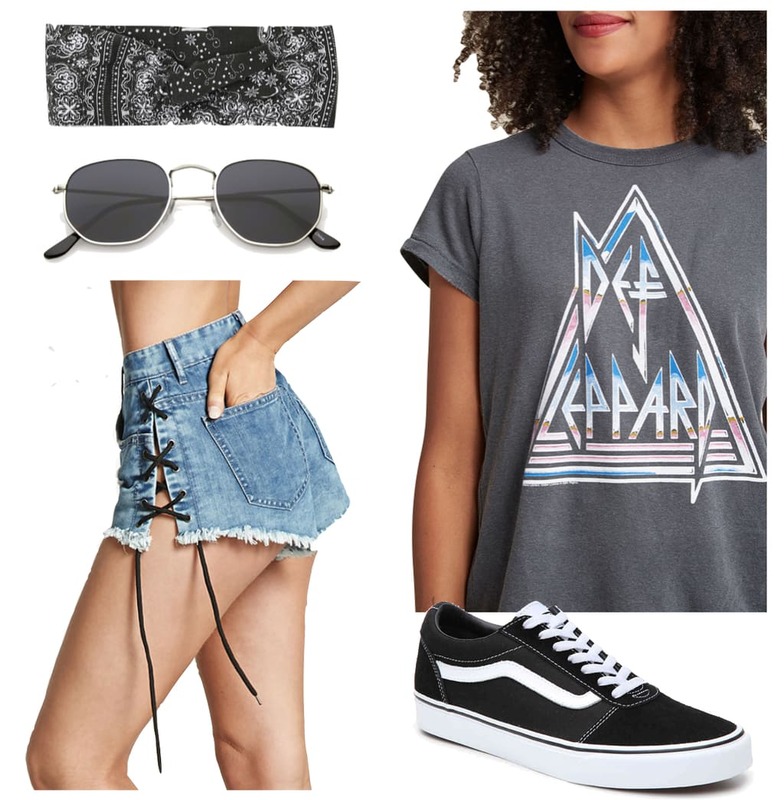 While on a yacht, she opted for a rocker-inspired look, wearing denim shorts with some contrasting lace-up detailing on the sides and a band tee. She accessorized with a bandana head scarf, hexagonal sunglasses, and some oversized, personalized hoop earrings. To get this Beyoncé-meets-rocker ensemble, start with a graphic print band tee and some denim shorts. This pair of shorts features a contrasting lace-up detail on the sides to give it extra edge à la Beyoncé. Add to the vibe with some metal hexagon sunglasses and a bandana pattern hairband. A pair of black low-top sneakers are a casual yet cool footwear option to bring the look together. Elsa Hosk is a master of model-off-duty style, and she looked ultra trendy in her recent summertime ensemble. Elsa wore a pair of red mom jeans with a white ruffled off-the-shoulder crop top and chunky black footbed sandals. She accessorized with some vintage-inspired sunglasses and a white Chanel shoulder bag. Elsa’s look is laid-back, but makes a major style statement. A pair of red straight leg mom jeans is a unique choice, and the jeans’ color is a fun choice for summertime wear. Pair your jeans with a white off-the-shoulder ruffled crop top and black buckled slide sandals. Some chunky black square sunglasses, which have a vintage vibe, and a white chainlink strap shoulder bag complete the look.